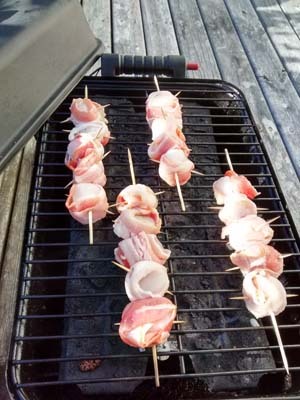 The Best of Nova Scotia? I've Known it for Ten Years! 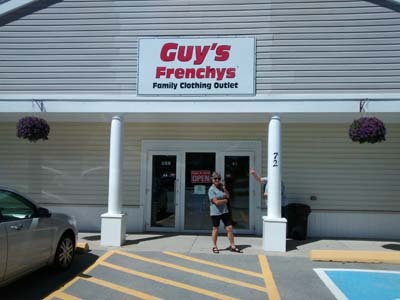 Although this is Randy's first time visiting the Maritimes, it is my fifth. Within the last 10 years, I've come to Nova Scotia three times specifically to visit a good friend who moved back here from Ontario. Gloria has made her retirement home on the south shore, not far from where she grew up. I have four other Ontario acquaintances who either returned or moved to Nova Scotia. With each visit, I find it easy to recognize why. Previous visits have been longer but so relaxing and comfortable and, in that way, this time was no exception. It was like coming home to a familiar place. 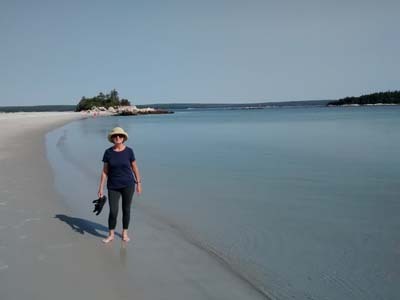 Our two days with Gloria fell right in the middle of our 5-week trip and it was the first time we spent more than one night in the same spot, so it was, indeed, a bit of heaven. We talked, laughed, ate and drank well (of course), did a little day-tripping, and took advantage of friendship privileges (showers and laundry access) that I'm sure any boondocker who has been on the road for a while can appreciate. 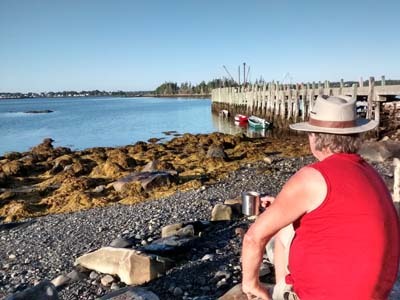 Morning coffee at the harbour, a few steps from our host's house. Local scallops were only the appetizer; we ate well! This next photo is for my sister. 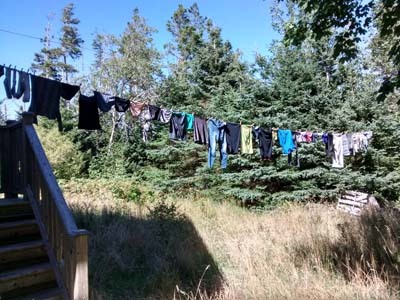 Among her many talents, she's an excellent writer and photographer and, when she and her husband traveled the eastern provinces a few years ago, one of her photo quests was to capture east coast clothes lines. How did I do, Lucy? Randy mentioned that we'd just visited Prince Edward Island's Basin Head Beach, reportedly, Canada's best beach! Gloria challenged that claim, suggesting we should stop at nearby Carter's Beach. Leaving Gloria's we were driving that direction, hoping to make Halifax with a few stops on route but we decided we could afford a quick stop to check it out. After all, we've seen a lot of great beaches on this trip and in other travels. Could this really be that much better? The answer is, "Yes"! Randy and I quickly agreed this may be the most beautiful beach either of us has EVER seen. Pristine, clear water and sugary, white sand is set off by scenic, rocky outcroppings. 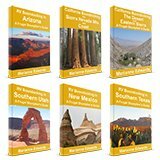 In our books, it's a serious contender not just for best beach in Canada but for beaches we've been in California, the Mediterranean, Costa Rica, and the Caribbean. We walked the entire length and were seriously tempted to linger all day. Frugal Discovery!Just like in Prince Edward Island, at Nova Scotia's Provincial Parks, there is no entry fee! Our next stop was Lunenburg, one of Canada's oldest ports. We managed to find parking (not easy). There's no such thing as a level parking spot in Lunenburg. It's reminiscent of San Francisco that way. 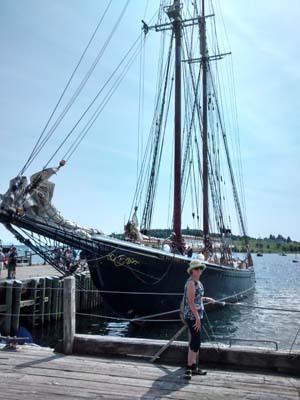 We had information that the Bluenose 2 was in port and, seeing it was on Randy's bucket list. 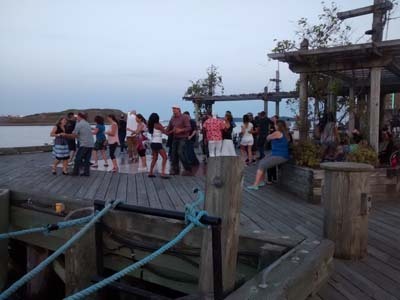 Although sailing excursions must be booked months in advance, we knew that the public is given the opportunity to board the ship for free when it's docked. What we didn't know was that we happened to arrive on "cleaning day" and so visitation was cancelled. We even volunteered to help with the scrubbing but they didn't go for it. 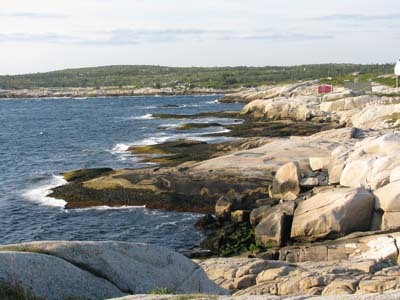 Peggy's Cove - As Good as the Hype? There are hundreds of very picturesque fishing villages across the Maritime Provinces, yet Peggy's Cove attracts visitors in droves. 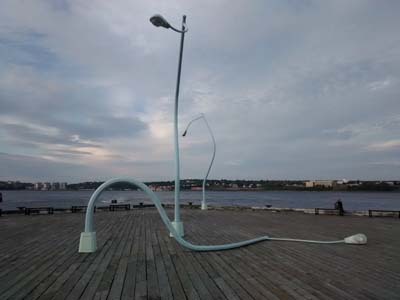 Artists and photographers have depicted the exact same scene over and over. 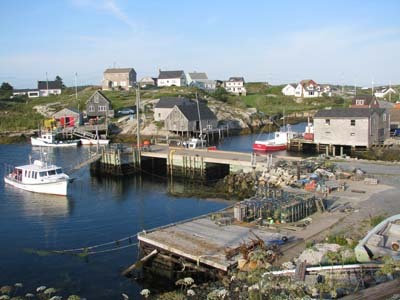 Is it just the proximity to Halifax (for tour buses) or is Peggy's Cove really THAT much more picturesque than other Nova Scotia fishing harbours? Having seen more than 100 very pretty fishing villages in the last 2 weeks, we're pretty confident we can make a fair comparison. Peggy's Cove is, indeed, a special place. Here's what impressed us: The village sits on a giant area of granite, rare on this coast and almost bare of vegetation; The modest homes and other buildings are original and sparse - as they would have been when the village was established; despite the tourist appeal, there are no hotels or fancy eateries; and the homes and businessess that do exist, in many cases, are occupied by the same families that have been here for centuries. So, it's special not only for it's unique beauty but because the village and landscape are unspoiled and real (despite the tour buses). 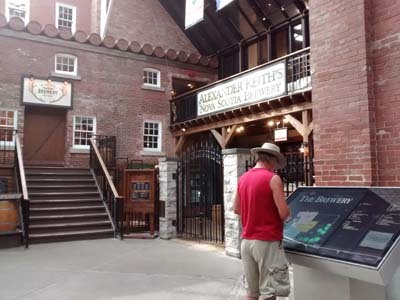 In Halifax, Randy's wish list included the Alexander Keith's Brewery Tour. That is, until he saw the cost. "What? $25 per person? I can buy a lot of beer for that!" 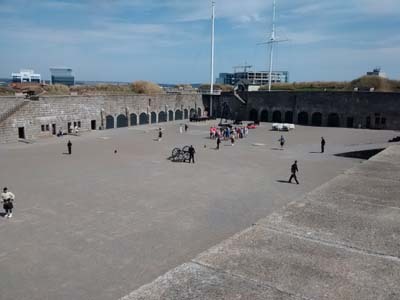 So we followed the city walking tour map and, after many interesting stops, ended up at The Citadel, a Parks Canada National Historic site, where an $11 entry fee provides good value. 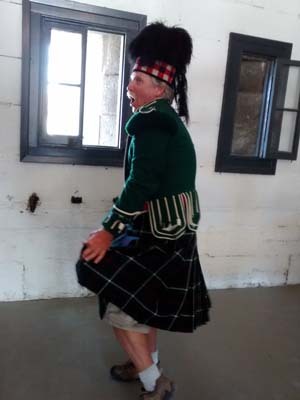 Randy, being of Scottish decent, got to dress the part and act as if he had done the Keith’s tour, after all (with more sampling than they actually provide). We had fun! Our favorite part of the city was the vibrant waterfront that includes the historic Pier 21 Terminal, where my parents, Dutch immigrants, arrived 65 years ago. I had been to this museum two years ago but Randy took the opportunity to search for the record of his grandparents who immigrated from Scotland in the 1920s. The boardwalk is lined with restaurant patios and various forms of entertainment. 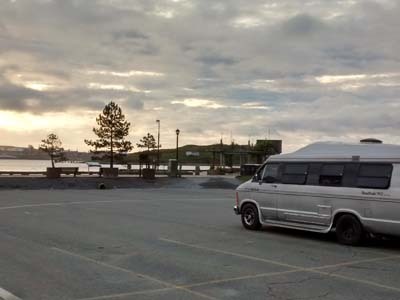 Thanks to Days End Directory, we knew we could park overnight in a lot right on the boardwalk, legally for only $6.00 per night. We spent both evenings enjoying the scene. 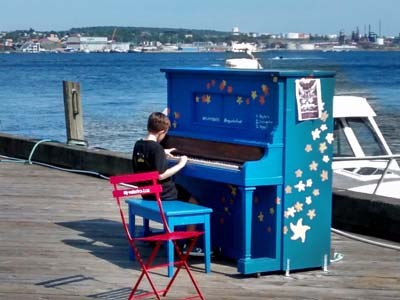 A boardwalk piano -there for anyone who cares to play. 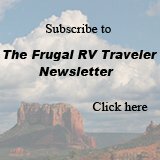 We joined several other RVs in the $6.00 per night parking lot. The Cities: old, beautiful. Even Halifax is small enough to be easily navigable.